Rock-N-Jocks has got the PERFECT MATCH for you once again for the huge release of the Retro 4 Jordans that drop Black Friday. This Custom Chicago Bulls New Era snapback is all black with the top of the bill in grey and the bottom of the bill in red. The embroidered Bulls logo on the front of the hat is in red, white, and black. The back has the smaller embroidered bulls logo in red and black. Only 30 total pieces for the world. Once it sells out it will not come back in stock. Do not delay. Go get yours only at www.rocknjocks.com. 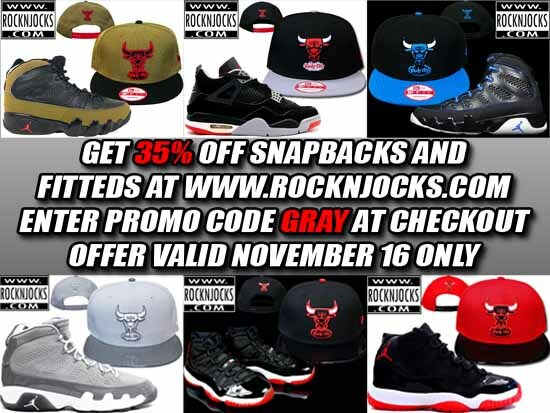 BIGGEST SALE OF THE YEAR is today only at Rock-N-Jocks with 35% off of all fitteds and snapbacks only. That is right, this one day sale is going to save you tons of cash for your Christmas gift needs. Enter promo. code GRAY at the checkout page to get this enormous savings. Hurry this sale only lasts one day. Go now, only at www.rocknjocks.com. Rock-N-Jocks is your source to match all of the RETRO JORDANS. 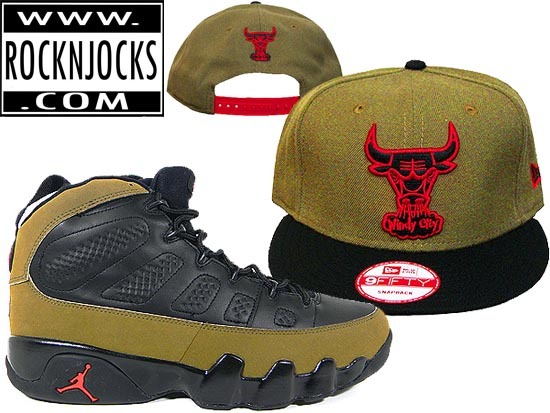 Once again a perfect match for the Retro 9 Olive Jordans that drop November 17th with this CUSTOM Chicago Bulls New Era snapback. This snapback is all olive with an all black bill. The embroidered bull logo on the front of the hat is in black and red. The back of the hat has the smaller embroidered bull logo also in black and red. Only limited to 30 total pieces. Once it sells out it will not come back in stock, so DO NOT SLEEP ON IT! Only place in the world to cop this is exclusively at www.rocknjocks.com.